i picked up your book cold tangerines a few days ago. i was trying to stay engaged with another book, one some friends of mine were reading at the same time. the book was about the gospel and doctrine, learning it again, and living it, as a Christian rather than a new believer. it was about the gospel being a living, breathing part of every day. i want that. i do. the gospel of Jesus Christ defines me. it is my heart. i don't think it always shows, and i don't think i pray over it, think on it, and live it enough. but His story is mine through salvation. and this book was beginning to walk me through that. but, if i'm being honest, i could hardly keep my eyes open reading it. i couldn't get into it. it was the kind of book that every time i picked it up, i sort of winced because i knew what was coming. it wasn't getting to me, He wasn't getting to me through it, as much as i wanted it to. as much as I wanted Him to. and i'm sure it was me, not Him, after all. and maybe if i prayed more over it, it would have. i don't know. but i do know that i picked up your book at the exact moment i was meant to. and in those first moments of reading it, i knew i had to write down my thoughts as i read, as to not forget anything in my letter to you. 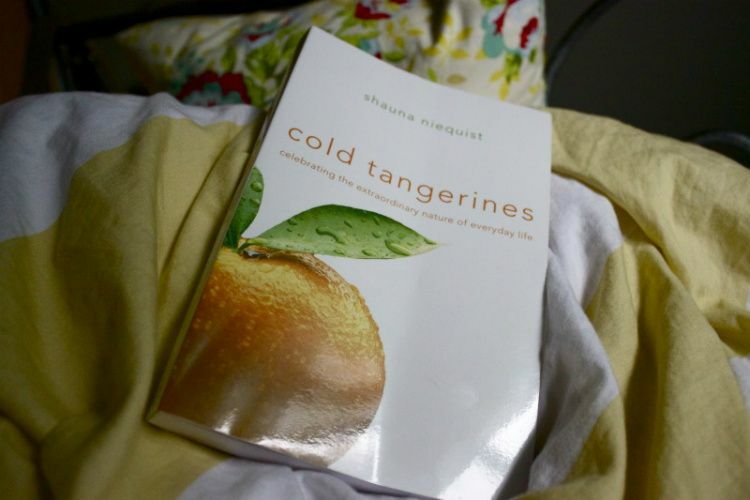 so here they are, my thoughts, questions, realizations and more … cold tangerines. this is me. not every little detail of it. but a lot of it; me. i have tried to fit that mold, like so many i love fit well into, and this may have been one of the first times that i realized that the way i feel His love, learn His love, and experience His love doesn't need to fit that mold. just like the book i was reading before yours didn't. just like it. i'm sure you've been asked many times before but, tell me more about the island. tell me it's name, so i, too, can go there. do you still go every year? and are you celebrating the new year there in just a few short days? part of me aches for the freedom, travels, and stories you have from your young adult years. the relationships you have, the ones you talk about so freely, i wonder if i would have more of those, or built more of those, had i not taken the path that i took. then the Lord quietly reminds me of His plans for me. and what they were then, and what they are now. your book has made me want to go back and write my stories. this blog is my stories, but i want to go back to the older stories. i want to revisit the places, people, and lessons learned. i want to see them from my eyes now. and right now, i don't want to stop reading, but part of me is craving to pick up my Bible, flip to exodus, and read it all. right now. while eating sharp cheddar on multigrain bread. in fact, there isn't much i would rather do than that right this very minute. i have never practiced lent before, and never really had the desire to until now. i want to say that i will this year but i am awfully scared to commit to it, which is all the more reason for me to do so. and do you know what? i know exactly what you should do with all those pennies. this. i can already envision it in your old house. i want to be like grandpa niequist, who left the new toys and baseball mitts floating in the creek. he's the kind of person i'd like to be, indeed. and what you said about prayer, about being prayer-ish... i feel that, and struggle with that, all the time. my conversations and mumbles to Christ throughout the day are constant. my pleas to Him in the midst of tragedy are real. but my every day looks something more like this: the boys remind me to pray before their macaroni and cheese at noon… and they are three and two. and, at night, when i fully intend on praying and letting Him hear all about my day, my mind wanders right after I say hello to my Savior. and instead of thanking Him, and telling Him, i start to drift into a deep sleep, or get up to pee one more time, or think about the exact shade of yellow that i want to paint the crib. i am prayer-ish. and trying to be, working towards being, prayer filled. this cold tangerine way of living, i can taste it, but so often times it feels like the life i live: the little house, little bank account, stay at home mom, stuck inside all winter with my kids life i live doesn't get the opportunity. but you changed that for me. you reminded me that choosing joy isn't always the easy option but it's always the one i want to choose. love that book so much. i've been wanting to reread it for awhile now, and this letter definitely solidified that. danielle, i think this is your christmas gift,..
thanks for sharing your thoughts, God is always bringing us to new heights of perspective so we can be more and more refined to look like Him. He just won't quit, isn't He amazing like that? one of my all time favorite books. for real. Wow. Your description makes it sound very powerful. I'll put it on my list. *huge sigh* I am prayer-ish, not prayer-filled. And it's hard. I want to be filled with prayer, but my mind jumps away so quickly. I can't wrestle it down, can't stay on one prayerful thought for more than a few moments. I've felt defeated by this, for so much of my Christian life. Only recently I've begun to embrace it - embrace the flighty prayers as better than nothing at all, as a starting point - but it still frustrates me. Especially because I can't describe it to people, and haven't found anyone else put it as eloquently as you did. Stunning review. I want to pick up that book NOW. i read 'bittersweet' by her and LOVED it. i asked for CT but didn't get it. now i've got to--sounds like something i can really relate to also! I really want to read this book now! Thank you for sharing. I'm gonna head to the Half Price Books or Amazon. the gospel is so good. it is not what you think it is sometimes. you think you have it...like ya ya ya...i get it. and then it grips you over and over again when we let it. i grew up a christian and i have loved the Lord, but feel like only recently, the Gospel has become new... it's like i'm starting to understand it. it's a weird thing to explain but it continues to change my life every day. okay, looks like i have a new book to get...i am so excited. Like whoa! Ok it will be my first download tomorrow after I purchase my new kindle..it's on amazon right? Checking into that now..thanks for sharing! Thank you so much for sharing this book. I started reading it a couple of days ago prompted by this post, and I LOVE it! I can't wait to read Bittersweet as well.